Are The Search Engines Really Indexing Flash? Finally - Wikipedia traffic statistics! Great tool for finding out how many page views a specific Wikipedia page is getting. The only catch is that you cannot filter out yourself. Keep this tool in the back of your mind! Do you feel that it is advantageous for traditional marketing/public relations companies to partner with Internet marketing companies? Should they create their own internal capabilities or out-source? We at Tork Marketing feel that our Internet marketing partnership programs allow agencies to fully serve their clients in both traditional marketing aspects as well as marketing on the Internet. We offer two types of partnerships: silent partner or ostensible partner. Your clients can know who we are or we can be behind the scenes. Why bother adding shared items to Google Reader? I am having a great time using the share feature in Google Reader. I "share" the articles that I find interesting and then I copy the code into the bottom of my blog so other people can follow what I've shared. It also allows me to update the content without having to go to two different places. Your shared items are available publicly at this web page. You can choose people to share with in Sharing settings. Email the link to your friends. Add a clip to your web site or blog. How do I add a clip to my website or blog? Use the check boxes to select the tag you want to share, or to select your shared or starred items. From the Change Sharing... menu, select Public. Click the add a clip to your site link. You'll see a preview of your clip. Customize the title, color, and number settings as much as you like. According to Wikipedia, the definition of Internet Marketing is "the marketing of products or services over the Internet. It can also be referred to as i-marketing, web marketing, online marketing, or eMarketing." does not run secret prisons. would shut down Guantanamo Bay. leads the world on human rights. Thank you to Bruce Clay, Inc. Thank you to Bruceclay.com - Usability Archives - Search Engine Optimization SEO Blog for posting a link to one of my SMX West 09 blog posts, Just finished the Meet & Greet at SMX West 09. I appreciate the gesture from one of the top authorities in the field! "It helps you validate the content of each page and prepare it for SEO, and it does it for every page you create or revise. With high-quality SEO-ready content, Pixelsilk is going to make SEO just that much easier for you; it is terrific." Pixelsilk is a web-based content management system (CMS) built from the ground up with search engine optimization (SEO) requirements at its core. The SEO CMS allows full access and control of the HTML to implement a branded design, custom development, e-commerce cart or search strategy – while still being easy for those editing content. Combined with real-time SEO advice, building awareness and traffic to your website and ultimately converting your consumers is at your fingertips. Pixelsilk is a web-based content management system (CMS) built from the ground up with search engine optimization (SEO) baked in. The CMS allows full access and control of the HTML to implement a branded design, custom development, e-commerce cart or search strategy - while still being easy to the content editor. When navigating the FEMA public assistance grant program, following a major disaster, eligible government entities and organizations can face hurdles that can delay and limit their financial recovery. Disaster Recovery Today, an informative publication, is an excellent resource that can prepare them for and then guide them through the FEMA process. RARE OPPORTUNITY! Authentic 1920's polar bear skin rug in great shape and available to ship anywhere within the United States. From tail to nose the bear is 9' long. Front paw to font paw the bear is 8' 7" wide. Claws are completely intact, hide is flexible and all fur is intact. There are no worn patches of fur. While it's always been easy to add social features to your site with Google Friend Connect, it just got a little more flexible with the introduction of the Friend Connect API. This API lets you access the core features of Friend Connect to use them on your site in interesting ways. After working in a profession for many years you might logically assume you don’t need to spend as much time learning still more about it. Take bowling. If you’ve been bowling for twenty years, do you still need lessons, or are you close to being as good a bowler as you’re ever going to be? You can practice every day, sure, but odds are you are at a point of diminishing returns. Live blog about the Intersection of Search and Social Media. Can't find who to follow on Twitter? Digg's own Kevin Rose has launched a new service called WeFollow that makes it easy to locate who is popular and to list yourself. One of the problems with Twitter is knowing who to follow in particular areas. Now Kevin Rose has launched WeFollow, a nice directory of people organized into categories. It’s not perfect, but it’s a great start and well worth visiting. That list of popular categories (or tags) is dynamic and has already changed since the site first launched. For example, socialmedia and marketing weren’t on it originally, but then they rose up. What happened? 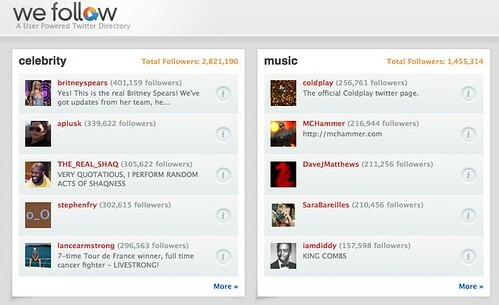 The top categories are based on the total number of followers that everyone in a particular category has. For example, at the time I wrote this, the "marketing" category had 76 people who have placed themselves into that category. Those people collectively had 60,236 followers. Just above marketing was the apple category. It had 93 people who had 73,617 followers collectively. The more followers a category has collectively, the higher it comes on the list. Amanda is a great mother who makes sure that DJ gets to experience all kinds of activities. He may not remember them when he gets older but we've got the pictures! What Kind of a Father will Ryan be? This commercial made me think of the kind of father Ryan Mortensen will be to his daughter, Zoe. Are You Listening? Or Are You Playing With Your BlackBerry Again? You probably don't want to hire a doctor who's obviously unhealthy or a lawyer who's just been released from jail. Similarly, you should look askance at any SEM agency whose online property is in a shambles. While it's true that most agency sites are fairly decent, a surprising number of them contain enough flaws to give prospective clients pause. What a nice surprise to see on the front page of the Los Angeles Times today a story that features how important SEO is to web sites.It’s Web 101 for this experienced intern covers how a former magazine editor, Lois Draegin, has entered a new life of online editing after losing her job with TV Guide. Go Laura, Keith and Racheal!!! Google wants to organize all the world's information. That's the official line, at least, but what it really wants to do is organize all the world's information and stick ads on it. It's the king of web search and search advertising, but what about the other things we do online? CheckUserNames is an online username checker that lets type in any username and check it’s availability across top 45 social networking sites. This comes in handy if you want to make sure you have registered your preferred username on popular social networking sites. About a week and a half ago, there was the start of discussion around Google's brand push in the algorithm. Some people started noticing that for some queries (mostly generic queries), more "big brands" were showing up in the search results. Enter several words, and it gives you all the available combinations of domain names.